If you’ve been thinking about it at all, just do it! Allow me to explain. I’ve been fortunate enough to be flying pretty regularly for 17 years now. I’ve flown quite a few different airframes, and enjoyed most of them (a couple of anemic 152’s had me less than thrilled during hot summer takeoffs, but even they were lots of fun once I got some altitude). One type of aircraft I’ve always wanted to fly but kept putting off was a tail wheeler (TW). Sure I had friends that extolled the virtues of TW aircraft. And we’ve all heard the (perhaps exaggerated) stories that you’re not a real pilot until you’ve become proficient in TW techniques, but life, as they say, tends to get in the way. TW training was one of those goals that just had to wait, and wait, and wait. 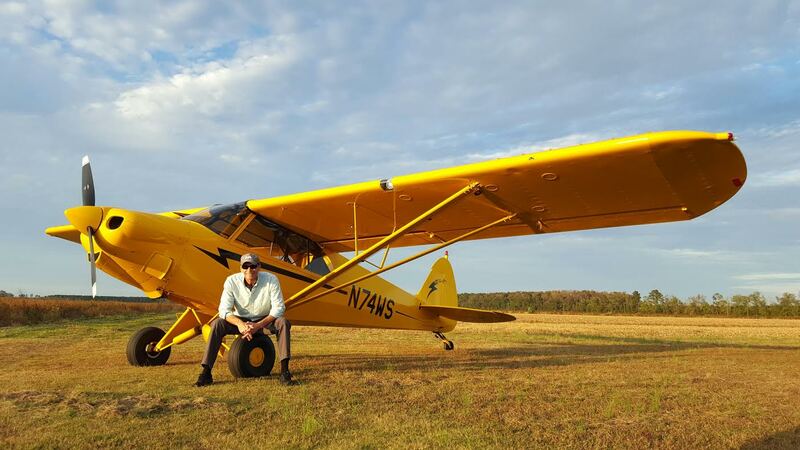 So, it was with great enthusiasm, and some apprehension, that I finally made the commitment to find an instructor and airplane that could fulfill this long standing wish. All pilots share the instructor experience. Without instructors we would literally never get off the ground. Likewise we all know how important instructors are to not only the critical learning that must take place, but also the overall joy of the experience. The joy of it is after all why most of us pursue this not inexpensive form of recreation to begin with (I’ll ignore the commercial side of aviation for the moment; we’re not talking about work here!). Now that I’ve had a chance to fly with Charles I realize that I got lucky on several fronts. Charles is a true TW enthusiast. That enthusiasm carries over to not only his instruction but to the effort and care he puts into keeping his airplanes in great shape. If you’re not familiar with grass runways you are in for a treat. The same aesthetic pleasure one gets from seeing a well-kept lawn or golf course is multiplied several times (for pilots anyway) by the inviting 1850 feet of grass; grass just begging for some airplane tires (preferably BIG ones!). Charles’ early correspondence with me made it clear that he does this for fun! He said that he sees every new person that comes to 05N as an adventure waiting to happen, and he really appreciates the opportunity to meet another potential or full-fledged TW enthusiast. After a few friendly email exchanges (with helpful articles and web links), and a homework assignment (if you’re not willing to put in some book work you’re probably not in the right training mindset), I was all set to start. At our initial meeting we discussed TW concepts, and what we would be working on that day. Never during any of the pre or post flight discussion did I feel like I was being rushed or made to feel that I was “on the clock,” in fact the opposite. Charles always had time to answer any of my questions or to just talk flying. It was a welcoming atmosphere, and one I haven’t always found when seeking instruction. After our initial discussions it was time to get a tour of the large, well kept, hangers at 05N and the jewels therein. If you’re unfamiliar with either Legend Cubs or Cubcrafters Sports Cubs then you are in for a treat. The aircraft Charles uses for TW instruction are real beauties; no beaters here! Both the Legend and Sports Cub provide a wonderful platform for learning TW techniques. I have very little experience with the original J3 Cub but I can tell you that my 6’3″ frame really appreciated the extra room provided by these modern J3 variants. Combine the updated engineering with a 100hp Continental up front and you get a recipe for serious fun! I won’t dwell on the actual flying instruction because I’m still a novice TW pilot, but suffice it to say that every sweat inducing hour at the controls was a thrill. Charles always displayed a great deal of knowledge, skill, and patience. He will certainly let you know where you messed up, but in a way that just makes you want to fix it and do better next time. I’ve already talked about how much I appreciate the beauty and functionality of 05N, but the other wonderful aspect of this airport’s location is its close proximity to numerous other grass strips. We visited four other turf airports the first day, without having to fly more than 20 minutes in any one direction. These nearby strips allow you to concentrate on pattern work (takeoffs and landings are what the early stages of training are all about after all), without having to remain at the same airport all day. Another great feature of 05N’s location is its relative quiet in regards to other traffic. I really appreciate not having to compete with other aircraft when trying to get the most out of my instruction period. If you are looking for asphalt or towered operations (for some unknown reason), KISO, KPGV, and KOCW (just to name a few) are right next door. Regardless of your goals or mission, Charles seemed more than happy to accommodate. In my case weather played a role as it often does, and my training was cut shorter than I would have liked. Despite the inclement conditions I was able to get my TW endorsement thanks to excellent instruction and Charles’ willingness to put in long hours while conditions allowed. But I am already planning my next visit to 05N to take advantage of an instructional trip to Morganton, for a visit to some of the 30 plus mountain and foothill strips. Charles assures me that that trip is blast! Of that I have no doubt.